Nettle fibres have been labelled the material of the future, being ecologically friendly, sustainable and a much needed alternative to plastic fibres. We thought we would delve into the history of nettle fibres, how they are made and the properties and benefits that have given them this lofty title. The use of nettle fibre for clothing is not a new phenomenon. In fact, people have been using nettle fibres in this way for around two thousand years, with the earliest records being from the Bronze Age in Voldtofte, Denmark. There is also evidence of nettle cloth production from all over Europe, including Scandinavia, Poland and Germany, as well as in Russia, China and Japan. The use of nettle fibres for clothing declined from the 16th century as the cotton industry started to grow, being easier and more convenient to harvest. In Poland nettle fibres were used until the 17th century, to be replaced by silk and in Scotland, nettle fibres were used until the 19th century where it was known as Scotch Cloth. There was a brief resurgence of nettle fibres in Germany during the First World War, where it was used for uniforms, due to a shortage of cotton. Today, the use of nettle fibres is on the increase again with the need for sustainable natural fibres becoming ever more poignant. Nettles are biodegradable making them desirable over plastic-based fibres such as nylon, acrylic and polyester. They are also less resource- intensive to process than cotton so kinder to the planet. There are three fibre producing species of nettle. These are European nettle, Ramie and Himalayan Nettle. 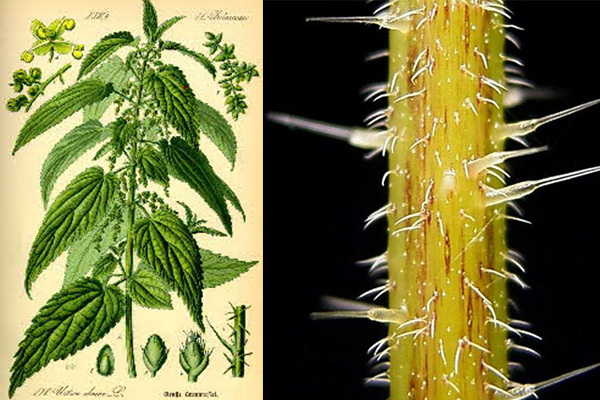 European Nettle is the most difficult to grow commercially, so it is usually the Himalayan Nettle, Girardinia diversifolia, that is used in nettle yarns. The plant can be found in Africa and several Asian countries and will grow well in fertile forest soils, growing up to 1.5 meters in height. Interestingly, the process of growing nettle fibres is kinder to the planet than growing cotton. This is because the plants require less water and also less pesticides making them a more sustainable option. Other than for extracting fibres, nettle plants can be used to make tea, beer, rennet to make cheese and as fodder for livestock. The fibres come from the nettle plant stem. The stem is cut and the bark removed allowing the fibre to be extracted with all the thorn-like stinging hairs removed. These fibres are then carded and spun producing a very strong cord useful for string, rope or fishing nets. For yarns, these fibres are usually blended with cotton or wool. The extracted fibres are white in colour and they are fine, long and very strong, measuring up to 50mm. The fibres are hollow, which means they are one of the most insulating due to the air trapped inside. Fabric created with nettle fibres will keep warmth in well, but will also be breathable too. A final property to mention is that dyes do not stick to the fibres and when blended with dyed wool, the yarn takes on a slightly mottled appearance which creates an interesting fabric. Due to the growing concern over the damage to the environment caused by growing cotton for fast fashion, there is now a new trend for stinging nettle fibres for use in ecologically friendly fabrics. There are now new advances in spinning technologies as well as cross-breeding to produce the best high-fibre yielding nettle plants. It has been said that nettle fibres, yarns and clothes are the materials of the future and initiatives such as STING; a British research project that stands for Sustainable Technologies in Nettle Growing, are working on how to best develop nettles for fabric. Needless to say, we are really excited about the use of nettle fibres in knitting yarns. Nettle fibres lend themselves particularly well to sock yarns which require a stronger fibre blended with wool to last well with high abrasion. Nettle fibres provide that strength needed whilst being environmentally friendly. 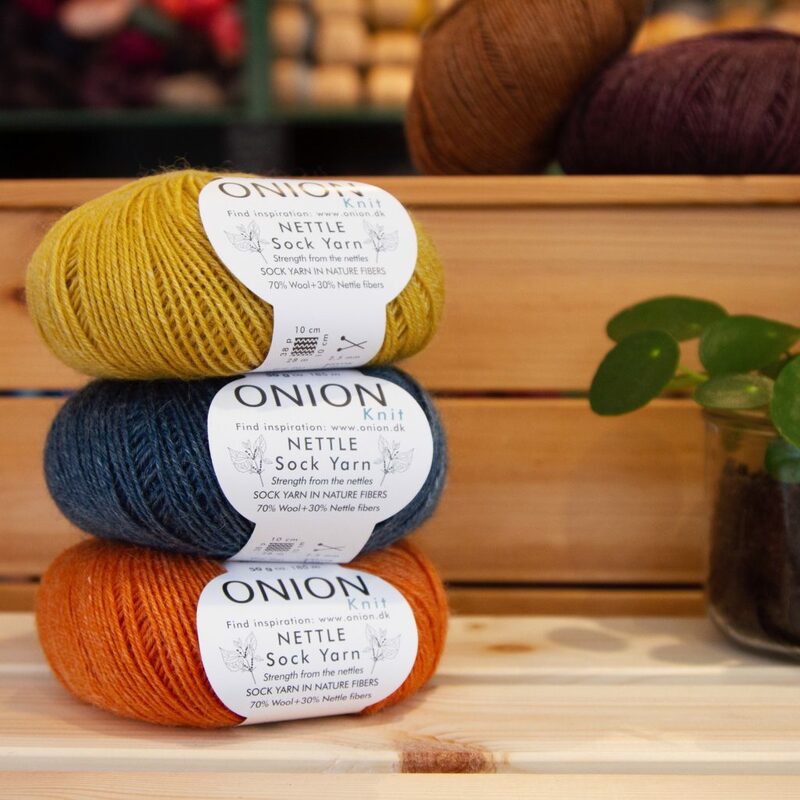 We were so pleased to discover Onion’s Nettle Sock, a blend of 70% wool with 30% nettle fibres and the most beautiful colour palette to boot. Have a look here to see the colours available and you can read how this yarn knits and wears here. Completed Project – Stockholm Sweater.